While the most effective way to keep birds away from your pup's food is to simply feed him indoors, this may not always be possible. Birds carry parasites and diseases, and their waste can contaminate your dog's food, which is why you want to keep the winged creatures away from it. Fortunately, a few nontoxic bird deterrents are available in garden supply shops to keep the winged ones from bothering with Fido's dinner. Free-feeding your pooch with a large bowl of food available to him anytime isn't a good idea because it can attract pests like bugs, rodents and birds. It may also cause him to overeat and become obese. Instead, feed your adult dog twice a day, giving him 15 minutes to finish each meal. During feeding time, whether indoors or out, supervise your pup and don't let any birds near his food. Some pet birds actually like chowing down on dog food, so keep pet Polly away during feeding time indoors. Most birds won't come over when people are around, and you can shoo them away if they do. Place around your dog's outdoor feeding space items that will scare birds away but won't frighten the pooch. Predator decoys like owls and falcons can help to scare away some birds. You'll have to move them around every few days to give the illusion to the birds outdoors that the predators are living things, although some clever birds may not be fooled. Balloons that feature pictures of predators or reflective surfaces may work better because they move around in the wind, giving them the appearance of life. Tie them to the side of your home, to the roof of your patio or from trees surrounding your dog's feeding area. Keep your dog's food in an area outdoors that he can access but birds can't. Use garden netting to surround a patio area by hanging it from the roof to keep birds away from your pup's food. Unfortunately, this will confine your dog to that area of your yard as well. Another option is to place your pup's food within a covered crate or outdoor dog house. While very bold birds might still venture inside these structures, they will be less willing to do so than if the food was left out in the open. Most birds like going into enclosed structures that are high up in the trees, not on the ground where they are vulnerable to predators. You can provide hungry birds that come to your yard some food of their own, which will effectively discourage them from eating your pup's food. Hang birdfeeders from trees or windowsills away from your dog's bowl. Fill the feeders with tasty bird seed mixes to lure the birds. If you're dealing with a kibble-stealing pet bird indoors, make sure that Polly always has some yummy fresh fruit, pellets or a full bowl of seed to keep her busy in her cage. Some hungry pet parrots can figure out how to open the door to their cages to get to your pup's kibble if they don't have any food of their own. 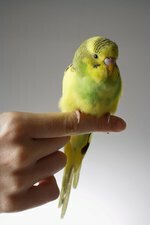 What Birds Can I Teach to Talk?